The discovery sets a new record for greatest number of habitable-zone planets found around a single star outside our solar system. All of these seven planets could have liquid water -- key to life as we know it -- under the right atmospheric conditions, but the chances are highest with the three in the habitable zone. "This discovery could be a significant piece in the puzzle of finding habitable environments, places that are conducive to life," said Thomas Zurbuchen, associate administrator of the agency's Science Mission Directorate in Washington. "Answering the question 'are we alone' is a top science priority and finding so many planets like these for the first time in the habitable zone is a remarkable step forward toward that goal." At about 40 light-years (235 trillion miles) from Earth, the system of planets is relatively close to us, in the constellation Aquarius. Because they are located outside of our solar system, these planets are scientifically known as exoplanets. This exoplanet system is called TRAPPIST-1, named for The Transiting Planets and Planetesimals Small Telescope (TRAPPIST) in Chile. In May 2016, researchers using TRAPPIST announced they had discovered three planets in the system. Assisted by several ground-based telescopes, including the European Southern Observatory's Very Large Telescope, Spitzer confirmed the existence of two of these planets and discovered five additional ones, increasing the number of known planets in the system to seven. The new results were published Wednesday in the journal Nature, and announced at a news briefing at NASA Headquarters in Washington. Using Spitzer data, the team precisely measured the sizes of the seven planets and developed first estimates of the masses of six of them, allowing their density to be estimated. Based on their densities, all of the TRAPPIST-1 planets are likely to be rocky. Further observations will not only help determine whether they are rich in water, but also possibly reveal whether any could have liquid water on their surfaces. The mass of the seventh and farthest exoplanet has not yet been estimated -- scientists believe it could be an icy, "snowball-like" world, but further observations are needed. 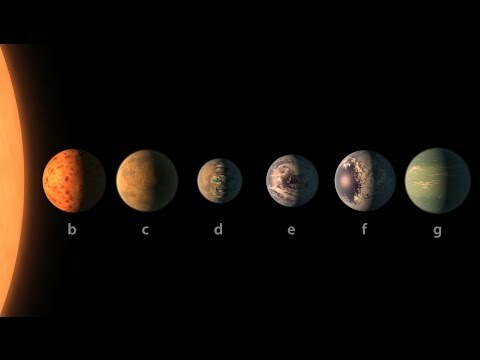 "The seven wonders of TRAPPIST-1 are the first Earth-size planets that have been found orbiting this kind of star," said Michael Gillon, lead author of the paper and the principal investigator of the TRAPPIST exoplanet survey at the University of Liege, Belgium. "It is also the best target yet for studying the atmospheres of potentially habitable, Earth-size worlds." In contrast to our sun, the TRAPPIST-1 star -- classified as an ultra-cool dwarf -- is so cool that liquid water could survive on planets orbiting very close to it, closer than is possible on planets in our solar system. All seven of the TRAPPIST-1 planetary orbits are closer to their host star than Mercury is to our sun. The planets also are very close to each other. If a person were standing on one of the planet's surface, they could gaze up and potentially see geological features or clouds of neighboring worlds, which would sometimes appear larger than the moon in Earth's sky. The planets may also be tidally locked to their star, which means the same side of the planet is always facing the star, therefore each side is either perpetual day or night. This could mean they have weather patterns totally unlike those on Earth, such as strong winds blowing from the day side to the night side, and extreme temperature changes. Spitzer, an infrared telescope that trails Earth as it orbits the sun, was well-suited for studying TRAPPIST-1 because the star glows brightest in infrared light, whose wavelengths are longer than the eye can see. In the fall of 2016, Spitzer observed TRAPPIST-1 nearly continuously for 500 hours. Spitzer is uniquely positioned in its orbit to observe enough crossing -- transits -- of the planets in front of the host star to reveal the complex architecture of the system. Engineers optimized Spitzer's ability to observe transiting planets during Spitzer's "warm mission," which began after the spacecraft's coolant ran out as planned after the first five years of operations. "This is the most exciting result I have seen in the 14 years of Spitzer operations," said Sean Carey, manager of NASA's Spitzer Science Center at Caltech/IPAC in Pasadena, California. "Spitzer will follow up in the fall to further refine our understanding of these planets so that the James Webb Space Telescope can follow up. More observations of the system are sure to reveal more secrets." Following up on the Spitzer discovery, NASA's Hubble Space Telescope has initiated the screening of four of the planets, including the three inside the habitable zone. These observations aim at assessing the presence of puffy, hydrogen-dominated atmospheres, typical for gaseous worlds like Neptune, around these planets. In May 2016, the Hubble team observed the two innermost planets, and found no evidence for such puffy atmospheres. This strengthened the case that the planets closest to the star are rocky in nature. 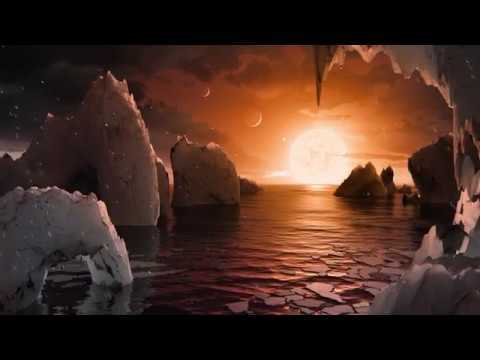 "The TRAPPIST-1 system provides one of the best opportunities in the next decade to study the atmospheres around Earth-size planets," said Nikole Lewis, co-leader of the Hubble study and astronomer at the Space Telescope Science Institute in Baltimore. NASA's planet-hunting Kepler space telescope also is studying the TRAPPIST-1 system, making measurements of the star's minuscule changes in brightness due to transiting planets. Operating as the K2 mission, the spacecraft's observations will allow astronomers to refine the properties of the known planets, as well as search for additional planets in the system. The K2 observations conclude in early March and will be made available on the public archive. Spitzer, Hubble, and Kepler will help astronomers plan for follow-up studies using NASA's upcoming James Webb Space Telescope, launching in 2018. With much greater sensitivity, Webb will be able to detect the chemical fingerprints of water, methane, oxygen, ozone, and other components of a planet's atmosphere. Webb also will analyze planets' temperatures and surface pressures -- key factors in assessing their habitability. NASA's Jet Propulsion Laboratory in Pasadena, California, manages the Spitzer Space Telescope mission for NASA's Science Mission Directorate. Science operations are conducted at the Spitzer Science Center, at Caltech, Pasadena, California. Spacecraft operations are based at Lockheed Martin Space Systems Company, Littleton, Colorado. Data are archived at the Infrared Science Archive housed at Caltech/IPAC. Caltech manages JPL for NASA. This artist's concept appeared on the Feb. 23, 2017 cover of the journal Nature announcing that the TRAPPIST-1 star, an ultra-cool dwarf, has seven Earth-size planets orbiting it. Any of these planets could have liquid water on them. Planets that are farther from the star are more likely to have significant amounts of ice, especially on the side that faces away from the star. This chart shows, on the top row, artist concepts of the seven planets of TRAPPIST-1 with their orbital periods, distances from their star, radii and masses as compared to those of Earth. On the bottom row, the same numbers are displayed for the bodies of our inner solar system. The TRAPPIST-1 planets orbit their star extremely closely, with periods ranging from 1.5 to only about 20 days. This is much shorter than the period of Mercury, which orbits our sun in about 88 days. This artist's concept shows what the TRAPPIST-1 planetary system may look like, based on available data about the planets’ diameters, masses and distances from the host star. TRAPPIST-1 is an ultra-cool dwarf star in the constellation Aquarius, and its planets orbit very close to it. They are likely all tidally locked, meaning the same face of the planet is always pointed at the star, creating a perpetual night side and perpetual day side on each planet. All seven planets discovered in orbit around the red dwarf star TRAPPIST-1 could easily fit inside the orbit of Mercury, the innermost planet of our solar system. In fact, they would have room to spare. TRAPPIST-1 also is only a fraction of the size of our sun; it isn’t much larger than Jupiter. So the TRAPPIST-1 system’s proportions look more like Jupiter and its moons than those of our solar system. The seven planets of TRAPPIST-1 are all Earth-sized and terrestrial. The first observations of the TRAPPIST-1 system reported in 2016 revealed three planets orbiting a small, red-dwarf star, though the exact location of the outermost one, was not well-determined (yellow band, top image). Follow-up observations with NASA's Spitzer Space Telescope, as well as ground-based telescopes, dramatically changed our understanding of this system, revealing a total of seven planets in Earth’s size range. Imagine standing on the surface of the exoplanet TRAPPIST-1f. This artist's concept is one interpretation of what it could look like. This illustration shows the seven TRAPPIST-1 planets as they might look as viewed from Earth using a fictional, incredibly powerful telescope. The sizes and relative positions are correctly to scale: This is such a tiny planetary system that its sun, TRAPPIST-1, is not much bigger than our planet Jupiter, and all the planets are very close to the size of Earth. Their orbits all fall well within what, in our solar system, would be the orbital distance of our innermost planet, Mercury.